Pawsibility provides counseling services for children and youth, including those with emotional and behavioral issues. We strive to make counseling a fun, supportive and engaging experience with the presence of our therapy dog. We specialize in the use of Animal Assisted Therapy, which is an experiential modality, together with elements of cognitive behavioral therapy and solution focused therapy. We help our clients to pick up positive social emotional skills and work through difficult situations. 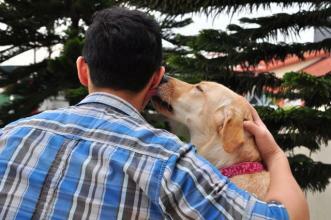 Dogs have an uncanny ability to reach out to a person who is feeling isolated. At Pawsibility, we harness the power of the human animal bond to touch lives, teach skills and motivate change. Singapore based counselling psychologist providing counselling, psychological assessment, clinical supervision, and accreditation certification in prepare/enrich & T-JTA. Dr. Lee's areas of specialty includes personal emotional issues, romantic/ marital relationships, family issues, chronic illness, addiction and psychological trauma. KC also focuses on personal, career and occupational growth for individuals seeking fulfillment and improving quality of life. Helping individuals, families & couples to cope with difficult life issues. I am a psychologist, psychotherapist and hypnotherapist, trained in the UK and USA. I am trained in family therapy, Adlerian therapy, Systemic therapy and hypnotherapy. I utilize a blend of cognitive, behavioral, experiential and hypnotherapeutic treatment interventions.